The Gospel of Matthew, says James Montgomery Boice, is "the first of the Gospels, the longest, the most Jewish, the most evangelistic, and, in many was, the most compelling." This two-volume expositional and inspirational commentary on the book of Matthew integrates rigorous scholarship and clear communication. It will inform and help a wide range of readers--from serious Bible students to interested laypersons--understand and apply the truths found in the text. Both volumes deal with Matthew's emphasis on Jesus as the Messiah or King of Israel. 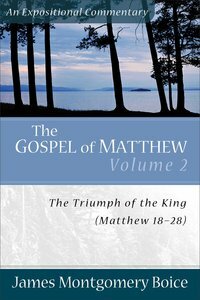 Topics in volume 2, The Triumph of the King, include -"The Citizens of the Kingdom" (18: 1-20: 34) -"The King's Final Break with Judaism" (21: 1-23: 39) -"The Sermon on the Mount of Olives" (24: 1-25: 46) -"The King's Death and Resurrection" (26: 1-28: 20) Boice not only explains the meaning of the text verse by verse and section by section, he also relates the text's concerns to the world in which we live, the life of the church, and the realities of the Christian li James Montgomery Boice (1938-2000) was senior pastor of Tenth Presbyterian Church in Philadelphia, Pennsylvania. He was also president and cofounder of the Alliance of Confessing Evangelicals, the parent organization of The Bible Study Hour, on which Boice was a speaker for more than thirty years. - Publisher The Gospel of Matthew, said James Montgomery Boice, is "the first of the gospels, the longest, the most Jewish, the most evangelistic, and, in many ways, the most compelling. To some people, now as well as then, Matthew is the most important book ever written." This two-volume expositional commentary on one of the Bible's most powerful books integrates rigorous scholarship and clear communication. Boice not only explains the meaning of the text verse by verse and section by section, he relates the text's concerns to the world in which we live, the life of the church, and the realities of the Christian life. Based on messages preached at Philadelphia's world-renowned Tenth Presbyterian Church, The Gospel of Matthew displays Dr. Boice's hallmark blend of thoughtful interpretation and contemporary insight for daily living. It will appeal to a wide range of readers, from serious Bible students to interested laypersons. About "Gospel of Matthew (Volume 2) (Expositional Commentary Series)"
The Gospel of Matthew, said James Montgomery Boice, is "the first of the gospels, the longest, the most Jewish, the most evangelistic, and, in many ways, the most compelling. To some people, now as well as then, Matthew is the most important book ever written." This two-volume expositional commentary on one of the Bible's most powerful books integrates rigorous scholarship and clear communication. Boice not only explains the meaning of the text verse by verse and section by section, he relates the text's concerns to the world in which we live, the life of the church, and the realities of the Christian life. Based on messages preached at Philadelphia's world-renowned Tenth Presbyterian Church, The Gospel of Matthew displays Dr. Boice's hallmark blend of thoughtful interpretation and contemporary insight for daily living. It will appeal to a wide range of readers, from serious Bible students to interested laypersons. James Montgomery Boice (D.Theol., University of Basel, Switzerland) was until his death in 2000, the pastor of Tenth Presbyterian Church in Philadelphia, the teacher on "The Bible Study Hour" radio program and chairman of the board of City Centre Academy. In addition to authoring numerous journal articles, he was a consulting editor for the Expositor's Bible Commentary. His books and many Expository commentaries include Foundations of God's City and the five-volume work The Gospel of John. "There's nothing today's church needs so much as to rediscover the doctrine, spirit, and commitments of the early Christian community," writes James Montgomery Boice. The power the early church exhibited for changes and growth is overwhelming. Although it faced enormous obstacles - it was completely new, it taught truths that seemed unbelievable, and it suffered intense hatred and persecution-the church managed to spread across the early world within the lifetime of the first generation of believers. In fifty chapters that progress through the book of Acts, Boice issues a challenge to believers to follow the first-century church. We are encouraged to glean the vital principles that enabled the early church to expand, and then apply them to our modern-day church. If we take time to study the expansion of the early church, we can spread the gospel the way it was spread during the first century-by the faithful preaching and teaching of the great truths of the Bible. 456 pages, from Baker. The Boice Commentary series combines careful scholarship and clear communication in a verse-by-verse and section-by-section reading of various biblical texts. Combining thoughtful interpretation with contemporary insight for daily living, James Montgomery Boice explains the meaning of the text and relates the text's concerns to the church, Christianity, and the world in which we live. Whether used for devotions, preaching, or teaching, this authoritative and thought-provoking series will appeal to a wide range of readers, from serious Bible students to interested laypersons. According to James Montgomery Boice, Paul's great letter to the Ephesians is "a mini-course in theology, centred on the church." Writing to the church in a city much like modern-day New York, Paul laid out his mature vision of the Christian faith's central elements. The apostle set these fundamental doctrines in the context of the church as the body of Christ. In this compelling commentary, Boice presents the message of Paul with great depth and clarity. The author proclaims the profound yet simple gospel once delivered to the church in Ephesus and effectively applies it to the modern church. Writes Boice: "There is no denying that Ephesians is deeply appealing, perhaps precisely because . . . it presents the basic doctrines of Christianity comprehensively, clearly, practically, and winsomely." With this helpful, thoughtful commentary as your guide, you are invited to discover the appeal of Ephesians for yourself. 304 pages, from Baker.